The simple answer is that cold therapy will help to reduce swelling which helps to reduce your pain. The RICE regimen (Rest, Ice, Compression, Elevation) has been used for decades to treat acute and chronic injury and assist in post-operative rehabilitation. When you're injured, your body protects the injured area by swelling. Sometimes, however, the body overreacts and the swelling becomes counter-productive. At this time, Cold Therapy becomes necessary. When Cold Therapy (an ice pack, CryoCuff, VascuTherm, or other cold-delivery device) is applied to your injury, it slows down the swelling at the injured site and your body can begin healing itself. Cold Therapy also acts as a topical pain reliever. 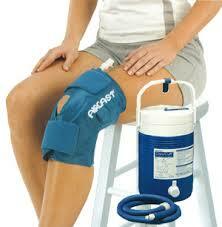 Some Cold Therapy machines like the CryoCuff or VascuTherm also utilize compression. Compression helps limit and reduce swelling also. Some people also experience pain relief from compression. When Cold Therapy and compression are combined, the area being treated gets a double dose of two extremely effective treatments which helps the body heal even more quickly. We highly recommend using cold therapy after your knee or shoulder surgeries. Too many patients are not given the option to use cold therapy simply because their insurance companies refuse to pay for this type of treatment. Click here to buy a cold therapy unit today. Still have questions? A Patient Care Representative is available to discuss your concerns and answer your questions. Please call us at 1 (877) 301-4276.